Beixin Housing Co. Ltd. is a member enterprise of China Construction Materials Group, the world’s top 500 central enterprise, and is one of the group’s “three new” industrial development platforms. Beixin Green Assembly Construction was established in 1979. The company was established in 2002. At the end of the same year, it was identified as the first batch of national residential industrial bases by the Ministry of Housing and Construction (formerly the Ministry of Construction of the People’s Republic of China). In 2017, it was named by the Ministry of Housing and Construction as the country. The first batch of assembly construction industrial bases. Beixin Housing has a complete chain of green assembly construction industries. It has built bases in Beijing, Sichuan, Jiangsu, Heilongjiang and Hainan, and has formed a nationwide industrial layout. On the basis of absorbing the advanced technologies of the world, the company integrates and innovates and continuously optimizes the housing system. The housing system has achieved digital design, factory customization, assembly and construction, and integrated decoration. At the same time, it is equipped with a complete management system of supply chain and a professional logistics and after-sales service system. To provide customers with green, energy-saving, low-carbon, intelligent solutions. Through long-term practice and accumulation, Beixin House has formed advantages in tourism vacations, high-end villas and residences, beautiful villages and special towns, public buildings and various types of management buildings, and has taken over the task of assisting the construction of disasters. Overseas markets have also achieved many successes. Projects have been successfully implemented in the Belt and Road countries and regions, and the products and services have been distributed in many countries and regions around the world. Teachers and students, designers, and people with relevant design practices of higher education institutions in mainland China and Hong Kong, Macao and Taiwan can contribute to the review. 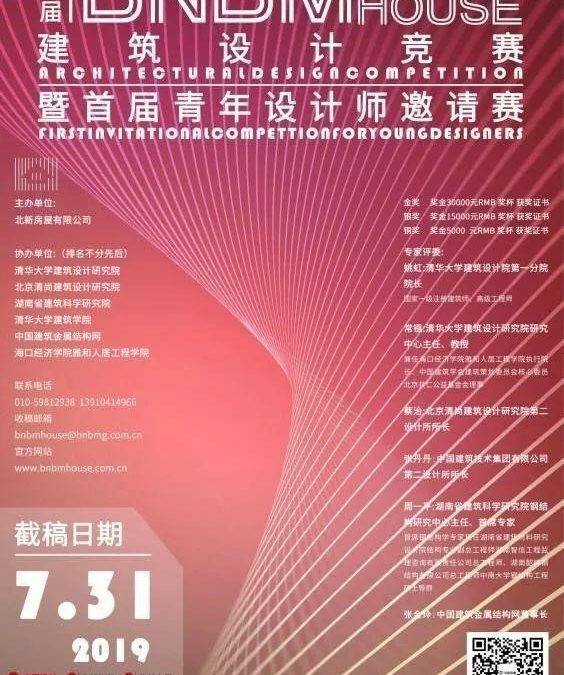 3, excavate and recommend outstanding architectural design talents. (1) The building should have the characteristics of standardization, modularity, and green ecology. The design concept and technology should be used in the plan, and the application of energy-saving, green, and ecological technologies should be considered as far as possible. (2) The design of the building is given priority to light steel as the building structure. It needs to be used by about 4-6 people at the time of design. The number of floors does not exceed three floors (including three floors) and the building area is about 150m2 -300m2. The overall plan needs to be accompanied by a courtyard layout design. (3) The design focuses on thinking about the lives of the occupants, forming stereotyped residential products through rational interior design, giving full consideration to the sharing of space design in the interior layout, satisfying the content of life supporting, and creating as many kinds of activity spaces as possible for residents to exchange and interact. To facilitate the lives of the occupants. The official language of the competition is mainly Chinese. Please submit the works and related documents in electronic format. The competition committee will print the drawing board and display it. Specifications:(1) Please layout in the vertical layout of A2 drawings, and submit a single work picture, a single file size below 10 Mb, the photo file of the submitted work is: name + unit + work title, Each author cannot submit more than 3 works(or 3 series). (2) Content: Include general plane (including courtyard layout), building plane, facade, profile and perspective effect map and necessary analysis diagram, additional word design instructions. 4. Feasibility of scale production and market application potential. May 31, 2019, according to the time when the organizing committee received the registration form. The deadline for the collection of entries is July 31, 2019. The building design specification refers to 1, the low floor cold bending thin wall light steel house building design should avoid eccentric too large or in the corner to open the hole(as shown). When the eccentricity is large, the influence of torsion caused by eccentricity on the structure should be calculated. 2. Anti-shear walls should be evenly arranged in the building plane and vertical direction, and then the wall corners should not be open within 900mm on both sides of the wall. The upper and lower shear walls should be in the same vertical plane. When the shear wall up and down dislocation, dislocation spacing should not be bigger than 2m. Fig. 3 The ratio of length to width of the rectangular floor or roof enclosed by the shear wall should not exceed 3. The spacing between shear walls should not be greater than 12 M. When the width of the convex part of the plane is less than 2/3 of the width of the main body, the protruding length L should not exceed 1200 mm (as in Figure 3). When it exceeds, the protruding part and the main part should meet the requirements of this regulation on the length of the shear wall. If you want to know more about the participation method and detailed information, please feel free to contact us and we will reply you in 24h. Aimir CG would be glad to inform you of all kinds of design events and help you address the challenges of taking part in these competitions and contests. Do not worry. The consultation would be completely free.